I’m in a bit of a creating mood right now so when the excuse to make something different came up, I grabbed it. A friend of mine is putting her house up for sale and, as all the good HGTV shows tell you, you have to stage a home to attract buyers. She has a small wine room in the house that she never uses and I told her she needed to stage it. I suggested she put at least a few bottles on the shelves and then get a little table to put in the back, with a bottle of wine, a couple of glasses and maybe a corkscrew, just so people might imagine how the room can look. Well, she doesn’t have the table and is busy painting and doing the many other things people do when they are getting their homes ready for sale, so I decided to surprise her and make a table for her. As with my previous project, all of the wood in this one is just leftover scraps from previous projects... (still trying to stick with that upcycling/sustainable kind of theme in at least a general way.) I simply cut, glued and nailed the wood together in a basic design and painted it all black. 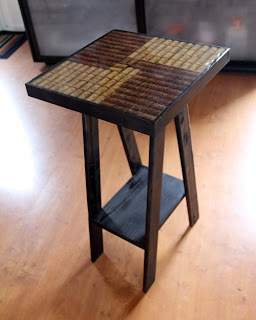 The finished piece is roughly 30 inches tall and 16 inches square at the top. The top is made from wine corks. I used about 90 of them, all of which I cut in half on a tabletop jigsaw. 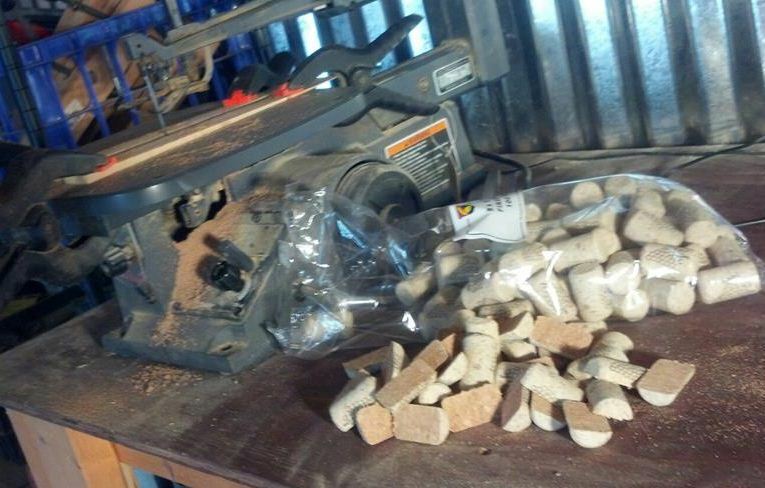 I wish I could say they were used corks but I had to resort to buying new ones, $15 for a bag of 100. If anyone out there would like to donate your used wine corks to me, I’d love to have them. I’m sure I can come up with an idea for a future project. Because new corks are pretty plain looking, I stained them with a medium and a dark stain, left over from the flooring I put in my basement. There are grape leaves imprinted on the corks . I cut them randomly so the imprint is fully there on some, half there on others, not there at all on others, and so on, because I didn’t want a uniform look. I laid the corks on the top of the table, with the wood edge around the table slightly higher than the corks. I then covered them with an epoxy/resin like you would see used on bar tops. Here’s where I have to embarrassingly admit to one of my mistakes, corks float. Who knew??? I know, it’s pretty obvious but for whatever reason I didn’t even think about gluing the corks down. Sure enough, as soon as I poured the resin in they started to float upward. There really wasn’t much I could do at that point but keep fiddling with it, trying to push the corks as far down in the resin as possible. Of course, as I pushed down three or four here, three or four others would spring up. For the most part I was able to work it out, but I wouldn’t advise trying to do it the same way again. I had to apply the epoxy/resin three times to cover them all, and fidget with it flowing over the side, which I would not have had to do if I had done it correctly in the first place. I learned some things that I would do differently in the future and that's what it's all about, learning and improving. And, in the end, I’m still pretty happy with how it turned out.